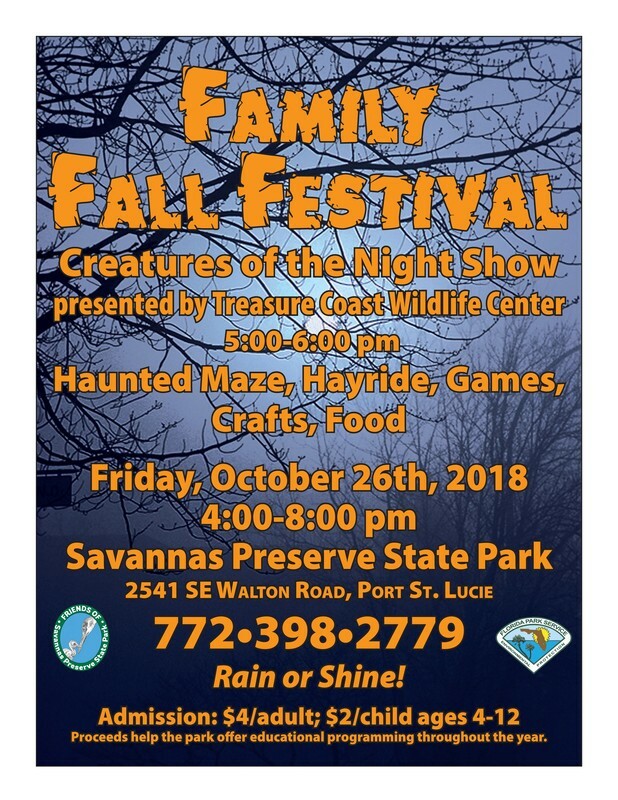 A freakishly fun and spooktacular event for the whole family is coming to the Savannas Preserve State Park! Join in the fun at this annual Halloween event sponsored by The Friends of Savannas. 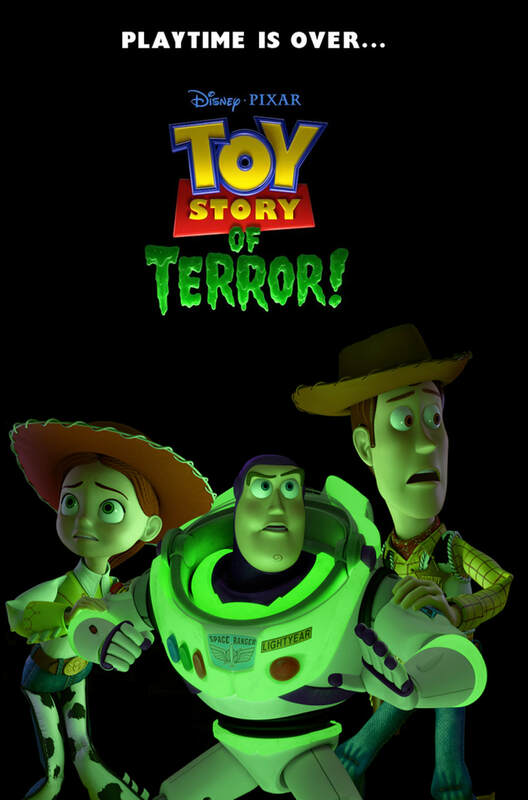 We invite you to participate in games, spooky crafts, scary (but kid-friendly!) movie showings and food vendors. Wind your way through the Savannas Haunted Maze to discover the eerie secrets hidden inside! The event will also feature a live animal exhibit sponsored by the Busch Wildlife Sanctuary. Hayrides will be available and will provide a unique opportunity to see this beautiful, serene preserve from a different vantage point. We kindly ask that you refrain from bringing any authentic or toy weapons, as well as alcoholic beverages. The 2018 event is Friday, October 26, from 4:00 - 8:00 p.m. Cost is $2 for children (ages 4-12) and $4 for adults. See photos of previous Halloween events. 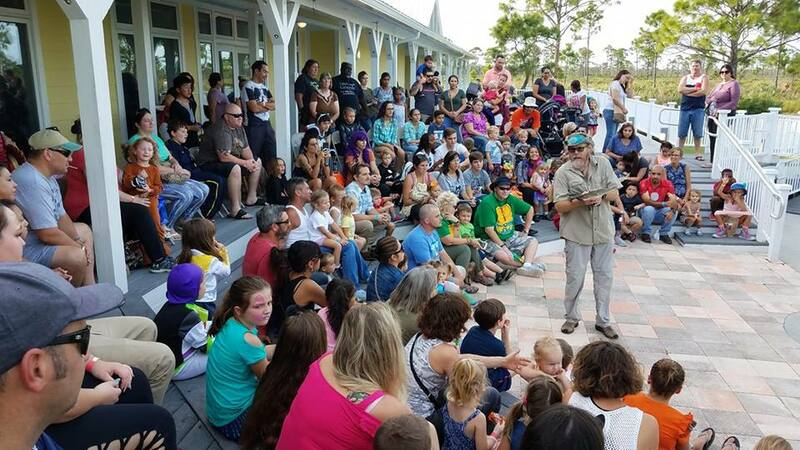 Tim Brown of the Treasure Coast Wildlife Center wows the audience at 2018 Family Fall Festival with his young crocodile. Photo by Paul Milette.